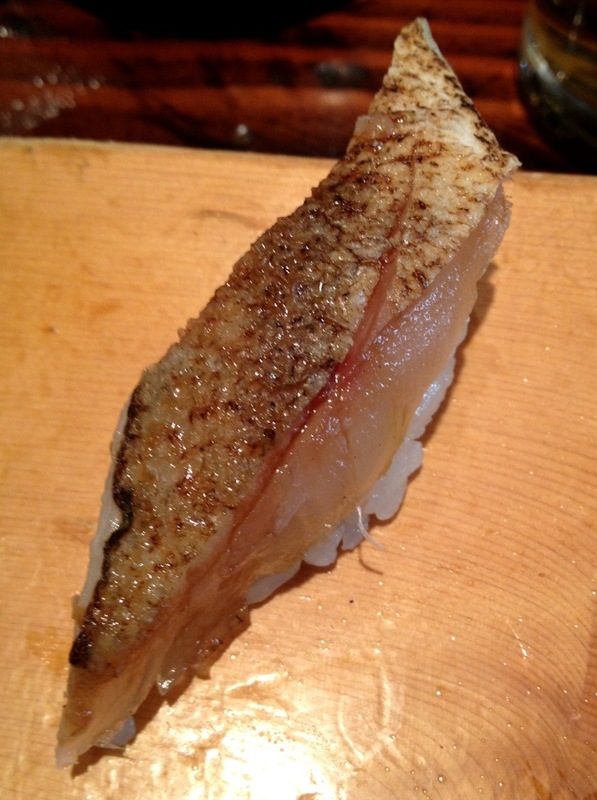 I usually prefer my sushi pure and straightforward, as it is at Sushi Zo and Hiko Sushi. Kiriko Sushi is a Jonathan Gold favorite, so I decided to reserve judgment on the use of mango slices and lots of sauces. 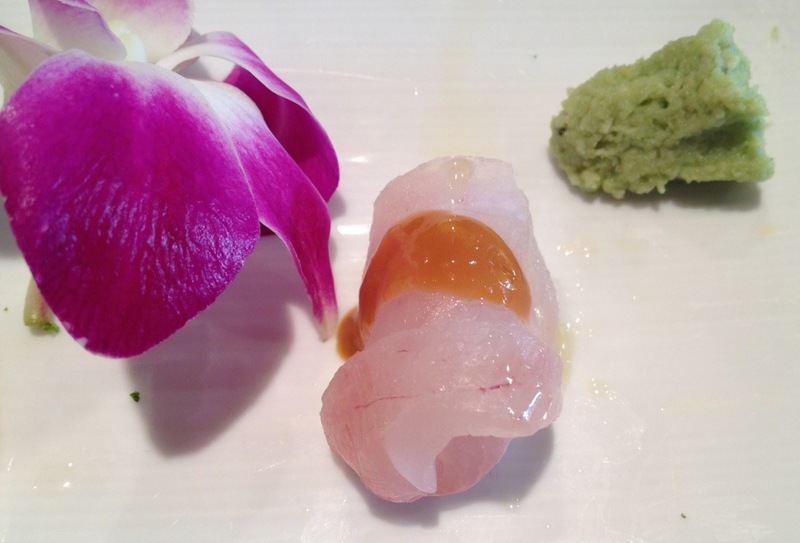 No surprise that Kiriko is really great, but it may have even turned me on innovation in sushi. You can order off the menu and have spicy tuna hand rolls (like the loud girls we were seated next to who had to take a smoke break in the middle of their fine sushi meal), but what’s the point? 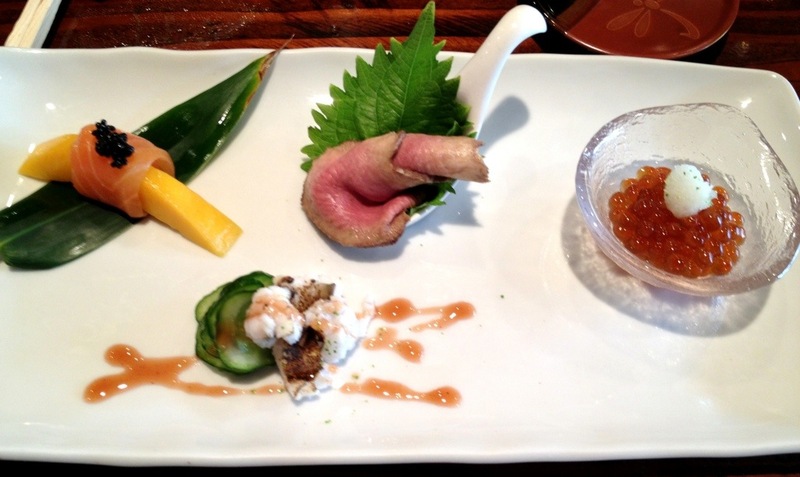 You’re here for the chef’s unique creations, so you really should just order the omakase and let the chef do his thing. 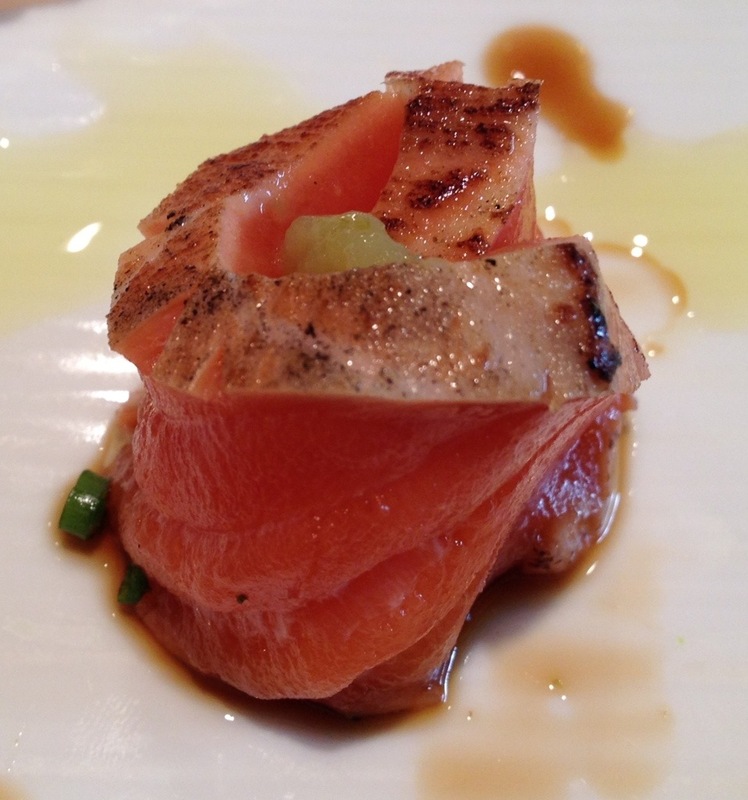 This is Kiriko’s signature dish: salmon wrapped around mango topped with a small dollop of roe. Just delicious. 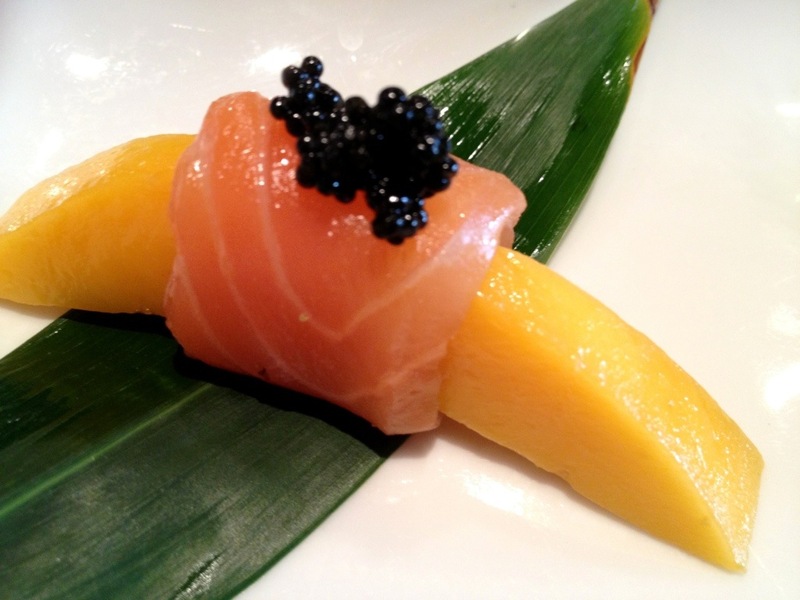 The salmon is excellent, super fresh without the funk of low-grade salmon, which marries perfectly with the sweetness of mango and the salt of the roe. I forgot which fish this was (a recurring theme in this meal, courtesy of my laziness and poor memory). But it was one of the few cooked fish. 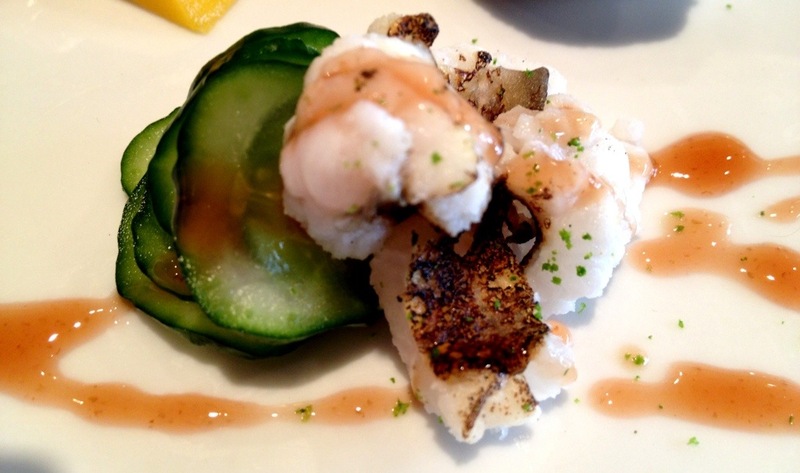 Served with thin slices of cucumbers and a light sweet sauce. Thin slices of beef tongue marinated in soy. Very chewy but tender. The flavor is a light version of a Korean side dish jangchorim, which I’ve never heard of being made out of tongue. 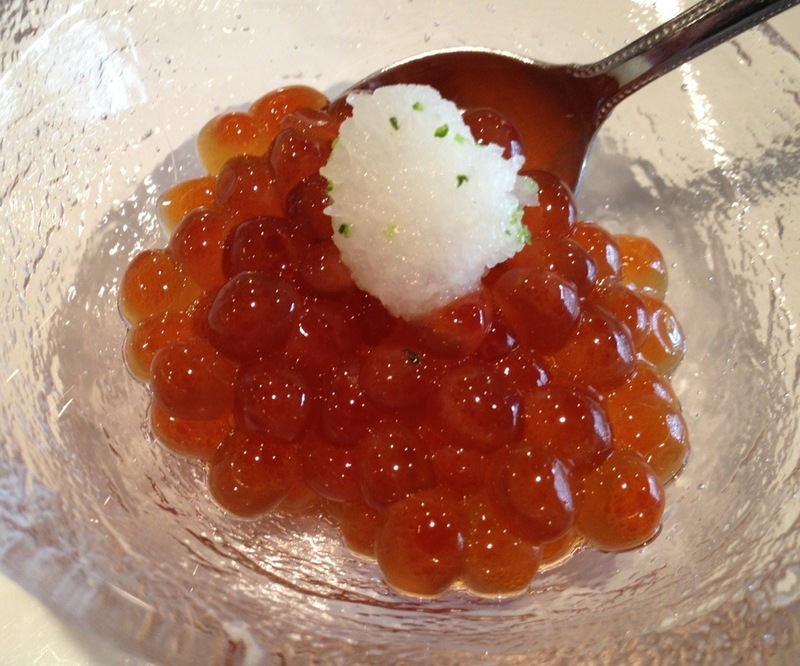 A small serving of salmon roe with grated daikon. 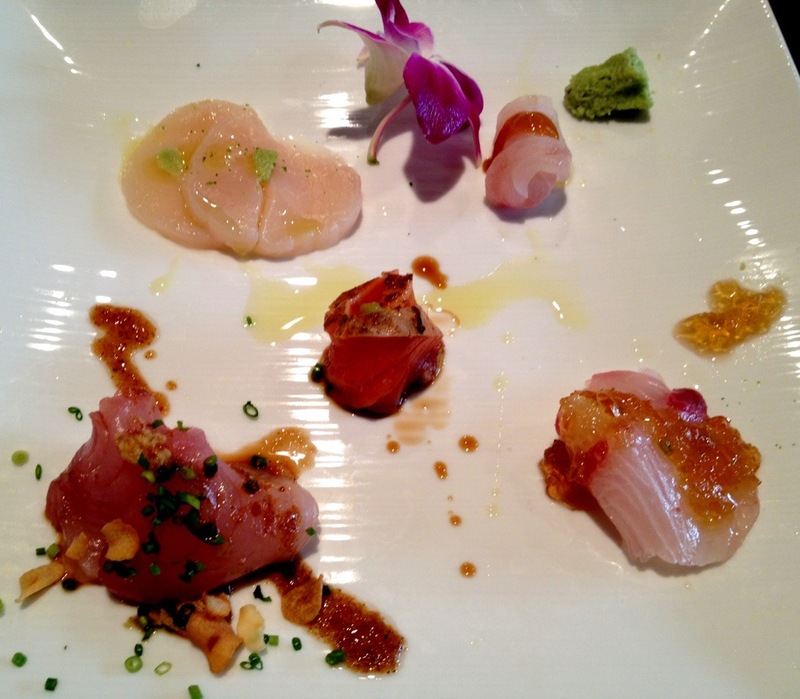 Next came the sashimi plate. Unfortunately, I’m not going to remember which specific fish and sauces were served, but this was great. The fish was expertly cut and super fresh, and each was served with an interesting sauce that highlighted the flavor of the fish. 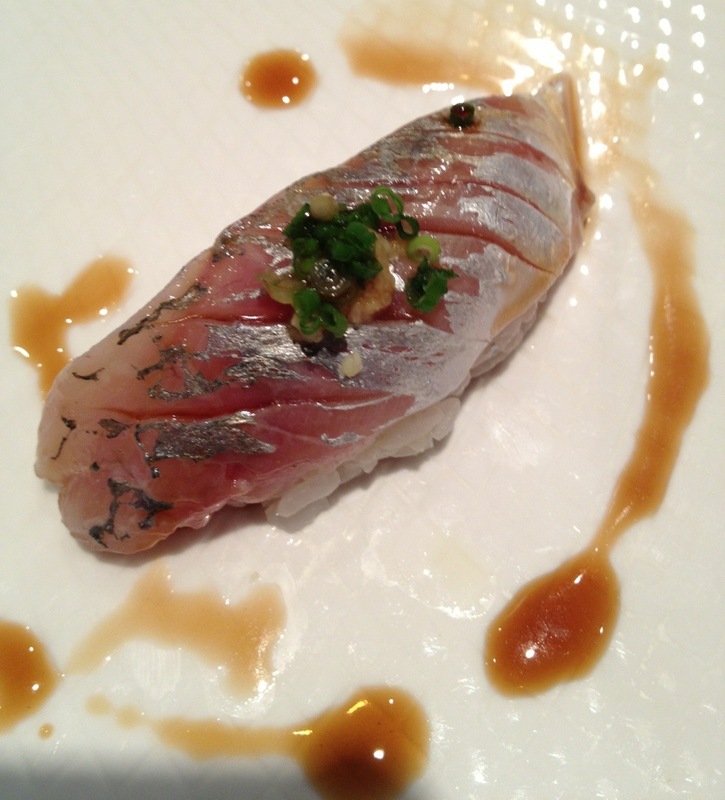 Yellowtail with fried garlic and chives. I think this was snapper with a unique gel sauce. 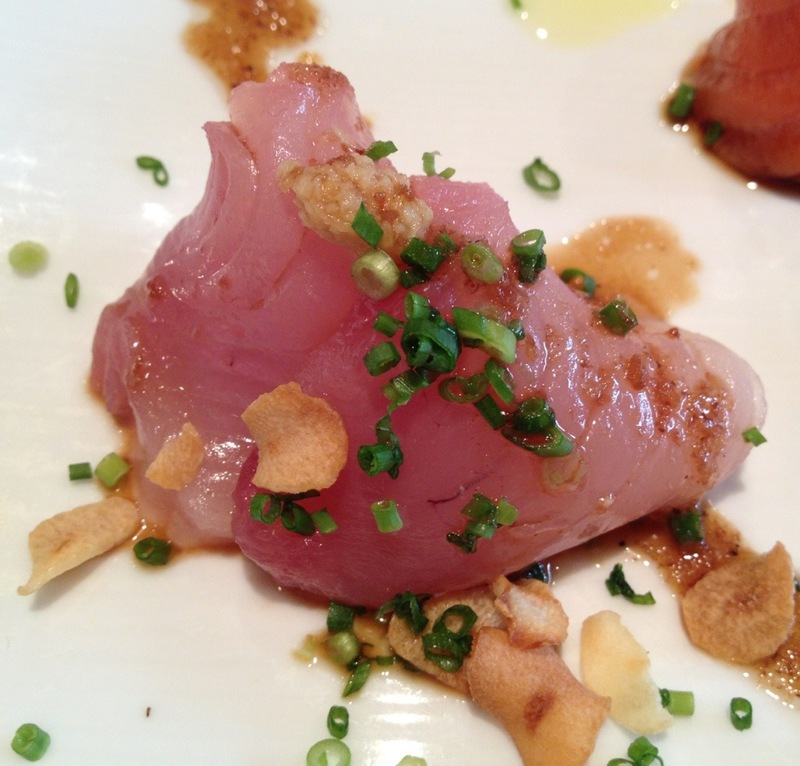 I think this was seared albacore. 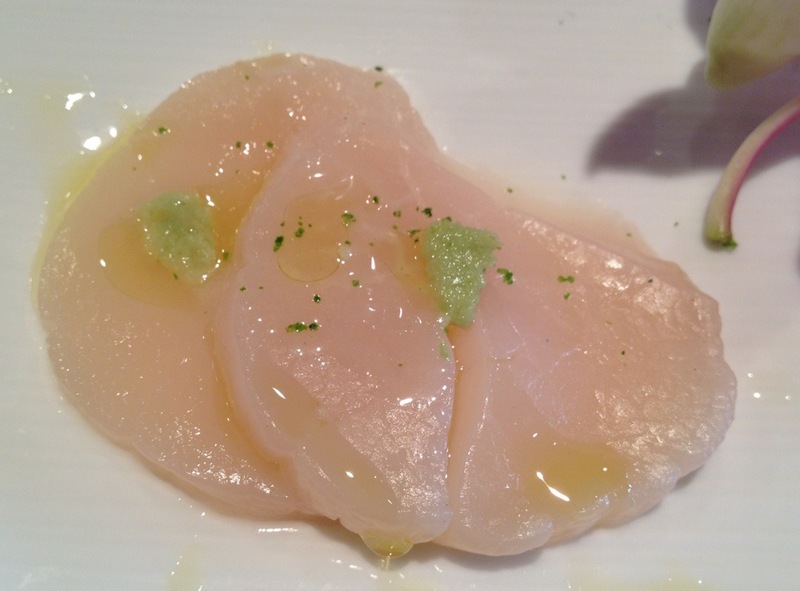 The raw scallop was memorable for its perfect texture and temperature, accented with a touch of oil and wasabi. Just beautiful. Next came the cavalcade of nigiri sushi. I don’t actually remember which fish these were. The nigiri were great, a decent size cut. I found Kiriko’s rice just a bit dry, at least in comparison to Hiko’s very wet rice and Zo’s perfect rice. 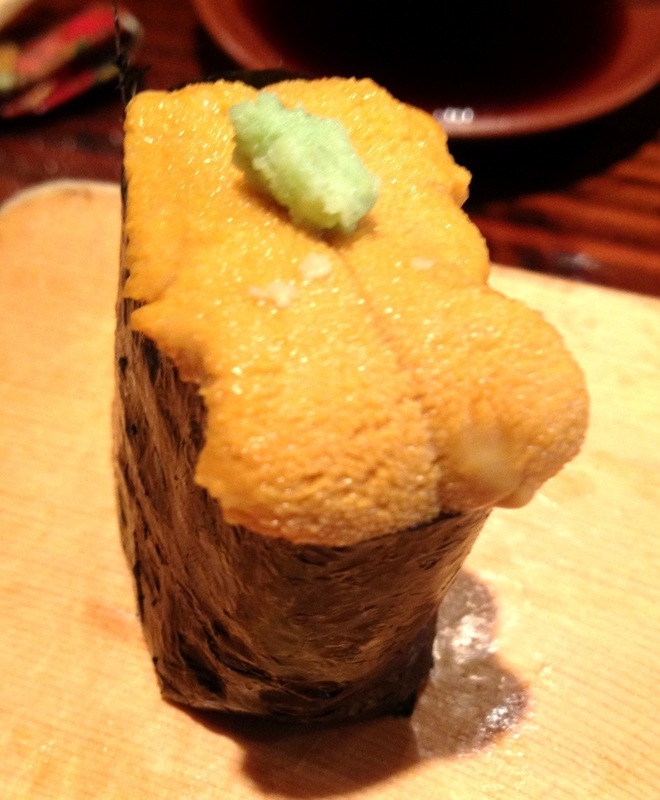 The uni, again, was memorable for its freshness. No unusual sauce or tricks; just excellent product carefully handled. 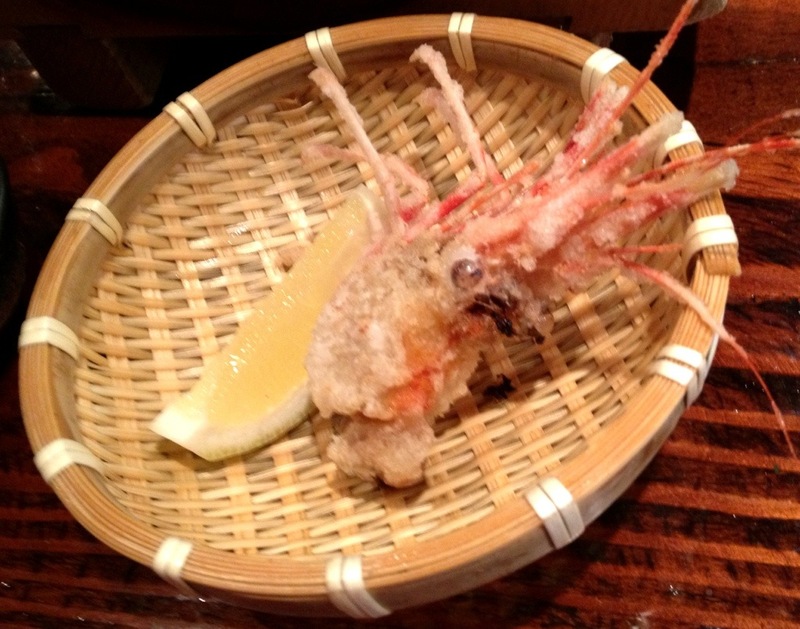 I didn’t take a picture of the amaebi sushi, live prawn. 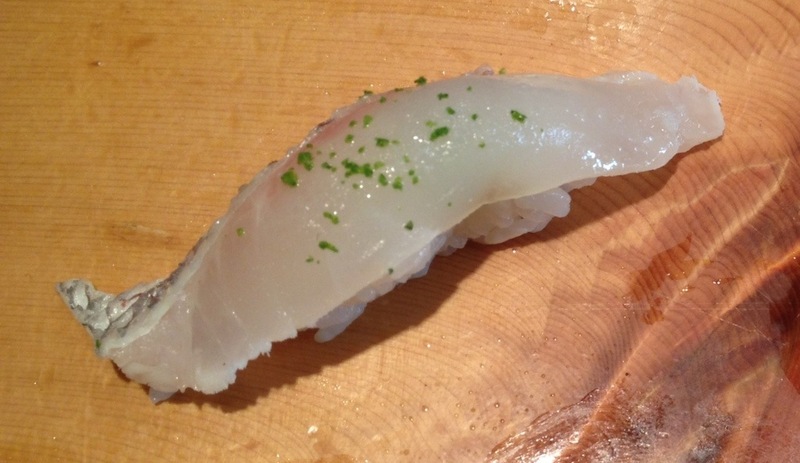 The chef pulls off the head while it is still moving and then serves the body as nigiri. I don’t love amaebi as a genre, but I had to admit this was quite sweet. 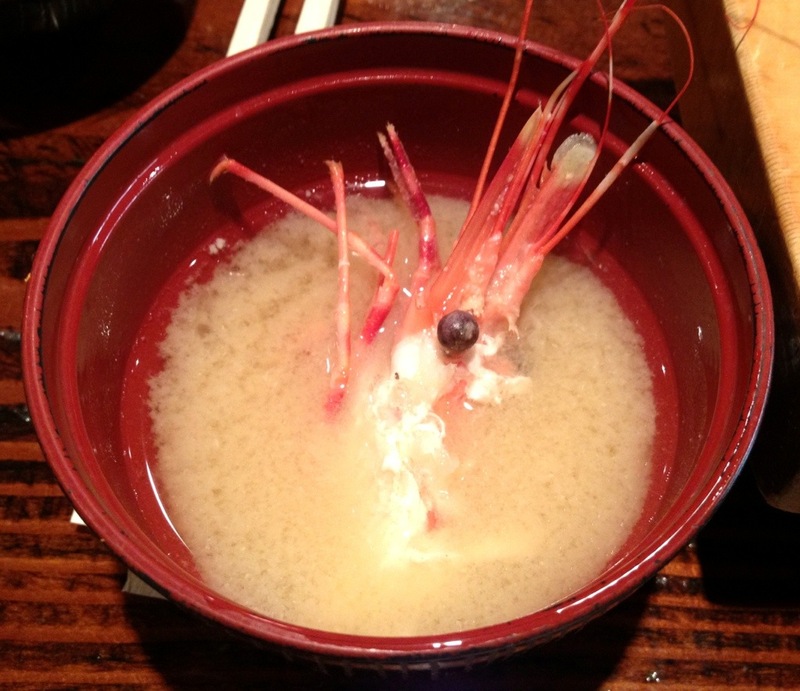 The chef then gives you the choice of having the fish deep-fried or cooked in miso soup. We each had it one way. We continued with the nigiri parade. 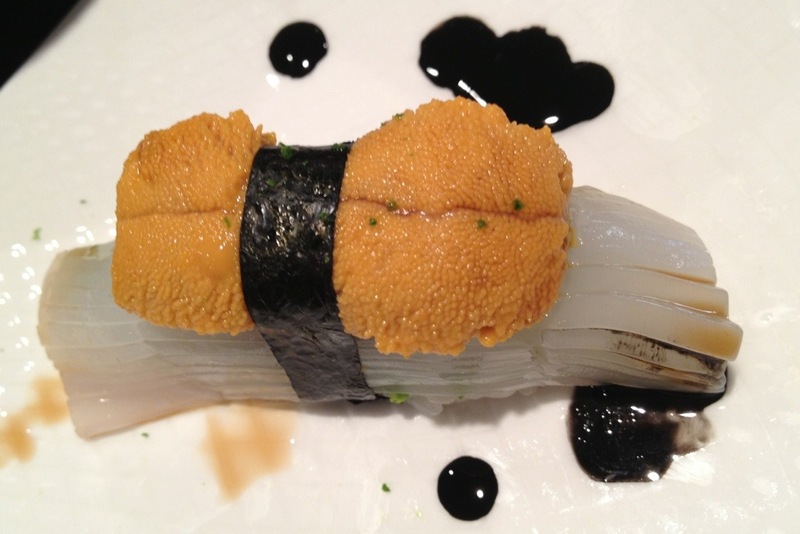 Squid and uni served with squid ink. Each element worked well with each other, the stronger uni flavor mixing with the bland sweetness of the squid. The small strip of nori added just enough salt to the bite. 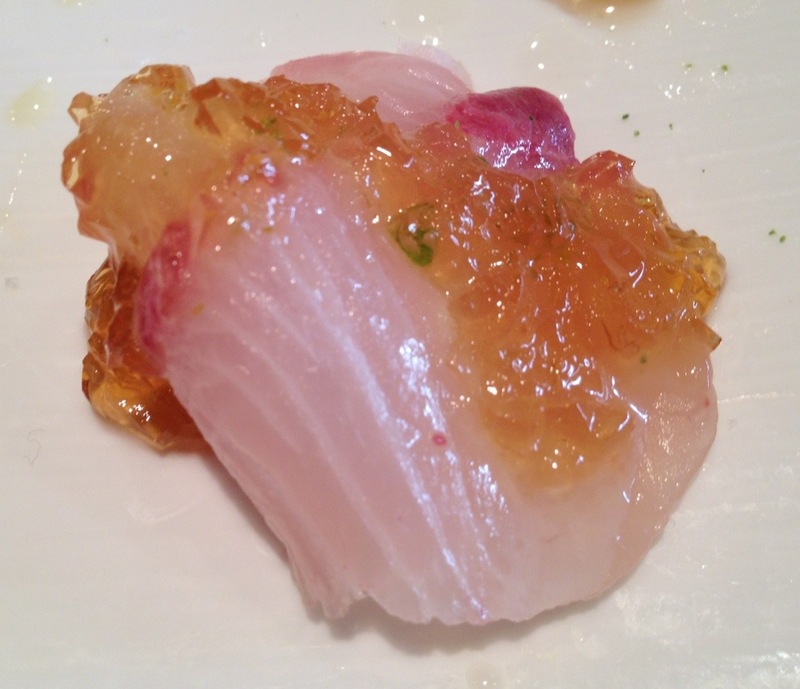 Overall, Kiriko was wonderful, surprising me with some new flavors married with pristine fish. 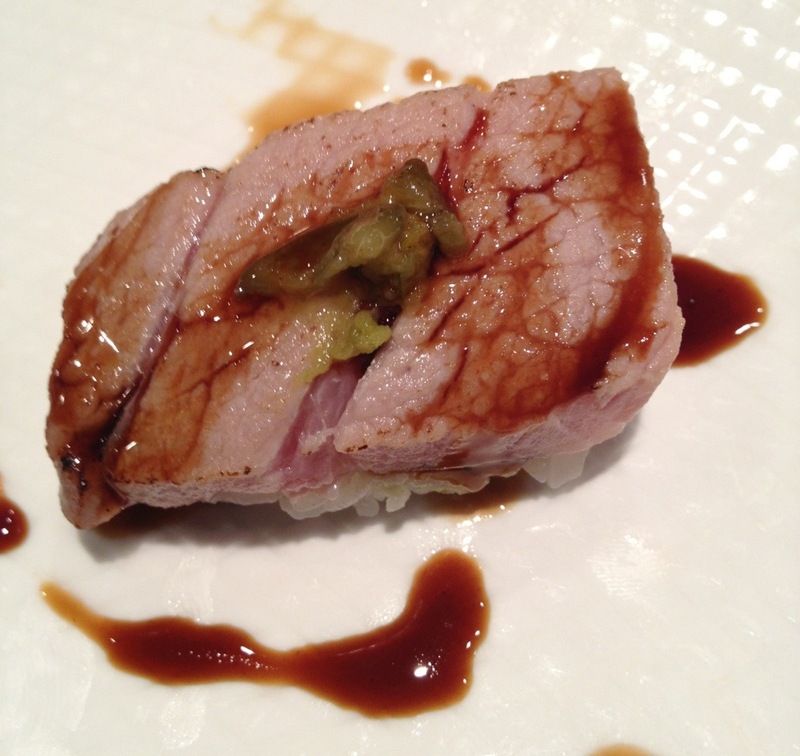 Cost was similar to Hiko and Zo at $100-$150 per person, depending on when you waive the white flag on the omakase. 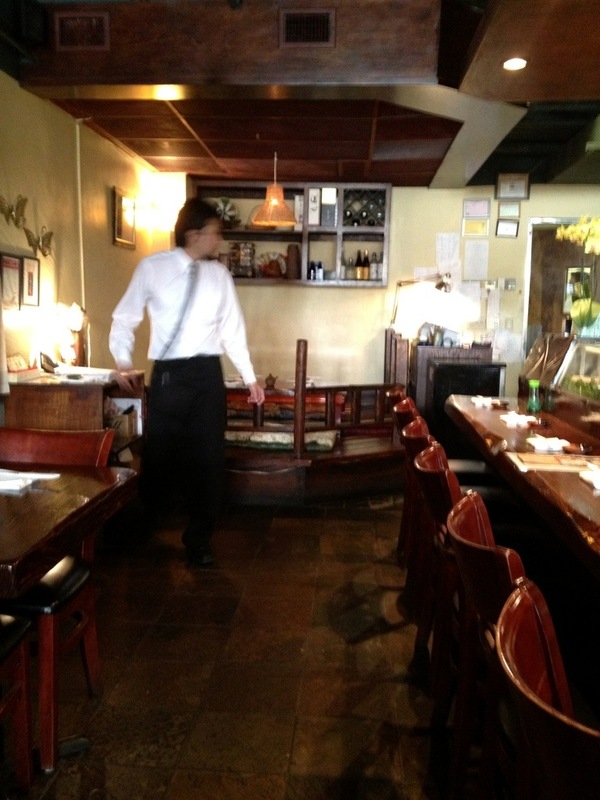 There were only two chefs working the sushi bar when I was there. Chef Namba was lurking in the back overseeing the show. The chefs were a blur of activity, putting so much effort into the slicing and saucing.